Should Modi Break With the BJP? 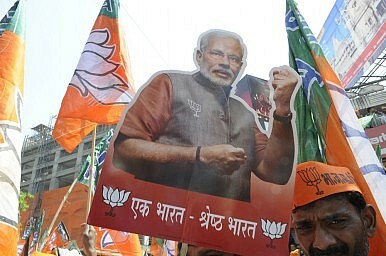 Even after the BJP’s latest victory, it’s clear that the party is heavily reliant on Narendra Modi’s personal appeal. Despite recent concerns among some quarters in India about the ruling Bharatiya Janata Party (BJP)’s attitude toward religious freedom and inability to implement major economic reforms, the party continues to do well. In India’s most recent round of elections, concluded this week, the BJP won in the central state of Jharkhand (as it was expected to). More importantly, it performed well in the Muslim-majority state of Jammu and Kashmir, quite a feat for a Hindu-nationalist party. In what has been considered one of the most important elections in the history of Jammu and Kashmir, the BJP won the largest vote share of any party (23 percent) and the second largest share of seats, winning 25, albeit mostly in the Hindu-dominated region of Jammu, as opposed to the Muslim-dominated valley of Kashmir. A regional party, the People’s Democratic Party (PDP), emerged as the largest party in the state, with 28 seats and 22.7 percent of the vote share. As no party won a majority, it is up to the PDP to form a coalition with either the BJP or the Congress Party, which won 15 seats. Therefore, there is a distinct possibility that the BJP may be part of the ruling coalition in Jammu and Kashmir. Thus far, it has come to power in every other state it has contested since Narendra Modi led the party to victory at the national level in May 2014. The BJP and its allies are now in power in several major states. 2014 has been a good year for the BJP. However, it is increasingly clear after almost half a year in power that the BJP’s electoral fortunes are due almost exclusively to the energy and vision of Narendra Modi, his team, and his developmental economic agenda. This brings to mind an interesting proposition: should Narendra Modi and those loyal to him form their own political party? For the past decade, before the Narendra Modi movement came to the forefront, the BJP saw only an average performance on both the national and state levels. By 2009, many analysts had even written off the party after a second consecutive defeat in national elections. In 2014, the party won primarily on an agenda of spreading economic prosperity and development, especially for the poor, as India’s economic growth and development had previously largely favored white-collar workers and the elite. This is not to say that voters were not interested in nationalism and defense issues but that they were primarily interested in economic development and strengthening the basics, such as infrastructure, health, and education. Plus, a dose of folksy nationalism from Modi was better appreciated than the elite attitudes of his predecessors in the Congress Party. The BJP was founded on the basis of Hindutva, an ideology of Hindu nationalism that can range from the mild and inspiring to the extreme. It is associated with numerous Hindu groups such as the Rashtriya Swayamsevak Sangh (RSS), a right-wing Hindu organization, though not formally so. Many leading figures in the BJP started out as members of the RSS, including Prime Minister Modi himself. The more Hindutva-oriented wing in the BJP has become especially prominent recently, believing that the electoral victory of the BJP endorsed their agenda of religious nationalism and revisionism. Indeed this wing has unwittingly begun to sabotage the developmental agenda that the BJP was elected for, since its actions and statements have provided fodder for opposition parties in India’s Parliament to hold up important legislation. Therefore, it seems that Modi and his supporters would be better off without the far-right wing in their own party, which is also what voters in India want. By breaking with this wing and forming their own party, they would be able to institutionalize and strengthen the portion of India’s political spectrum that is pro-development and pragmatic on economic issues. This position on India’s political spectrum has too often been neglected as most parties have tacked toward the left and regulations, or toward identity-based issues, though a market-based party, the Swatantrata Party briefly existed in the 1960s. Forming a new party would not necessarily mean giving up Hindutva as an ideology but shifting the core of the party’s focus heavily toward Modi’s core agenda, economics. Without Modi, it is possible that the BJP could revert to a party less open to free markets and investment and more extreme in its cultural views, something that can be prevented if Modism is institutionalized in its own party. It is not unheard of for ruling prime ministers to break away from their own parties and found new parties due to ideological differences. Former Israeli Prime Minister Ariel Sharon broke off from his own Likud and founded Kadima in order to pursue a more moderate path. On the other hand, it would be easier to work within the BJP, as it is already recognized and possesses electoral infrastructure. This would, however, require a power struggle within the party, since there are many elements of it that do not embrace the Modi agenda. If Modi and his supporters are successful, it would amount to the same thing as forming a new party but it will be harder to remake a party with such diverse elements than it would be to simply found a new party with exactly the ideology and individuals one wants. Nonetheless, such a new party would be fickle and unstable initially, while the BJP has proven to be a resilient party, even when it did not perform well, because of the very loyalty and devotion of its Hindu-right core. The fundamental fact remains: Indians really voted for Modi and his developmental agenda, rather than the BJP per se. In order to really continue pursuing this path, Modi and his supporters either need to purge the BJP of elements that are more interested in other issues or else take advantage of the pro-Modi agenda wave that is still sweeping across India and institutionalize their ideology by founding a new political party for that purpose. Otherwise, an internally divided BJP will not be able to accomplish much and the opposition, leftist or identity based parties will become emboldened and seem less ideologically discredited.